One of our very favorite authors is Newbery Award winner Kate DiCamillo. She's written The Tale of Desperaux, Because of Winn-Dixie, The Tiger Rising, The Miraculous Journey of Edward Tulane, and the beloved Mercy Watson series, among others. Two of her books (Desperaux, Winn-Dixie) have been made into movies. Now, one of her books, Mercy Watson to the Rescue! 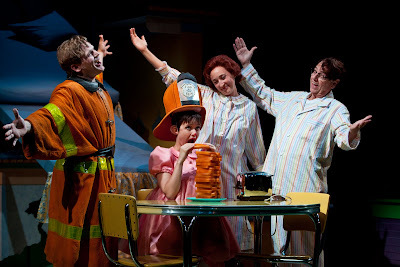 has been adapted into a play, at the Children’s Theatre Company (CTC) in Minneapolis, Minnesota. 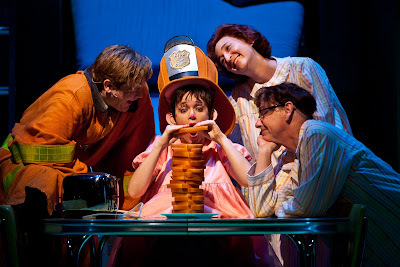 CTC is one of our very favorite theatres in the WHOLE WORLD, and to have this wonderful company adapt one of our favorite books is just butter on (lots of) toast. Mercy Watson to the Rescue! is an adorable madcap adventure, featuring one beloved pig and her search for buttered toast. Along the way, she saves the day (and involves the neighbors!). It's a fun read, and kids just love Mercy (our 9-year old does!). What a perfect book to turn into a play - and capture even MORE readers and theatre-goers with this adventurous series. The books are wonderfully illustrated by Chris Van Dusen, of Candlewick Press. The production looks true to his art, and also stays true to the story. Love it! Reed Sigmund, Sara Richardson, Mo Perry and Gerald Drake in Mercy Watson to the Rescue! Photo by Dan Norman. 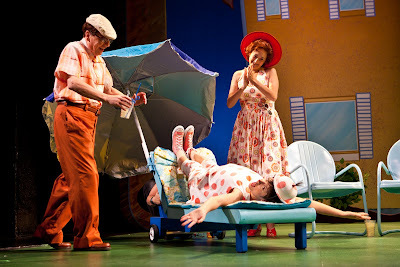 Gerald Drake, Sara Richardson and Mo Perry in Mercy Watson to the Rescue! Photo by Dan Norman. KD: I feel a little sheepish (piggish?) about admitting this, but I love all the characters. I really do. They all make me laugh. Leroy Ninker is a particular favorite (yippie-i-oh) and so is Animal Control Officer Francine Poulet. And Eugenia Lincoln. She is is so consistently, delightfully crabby. Baby Lincoln is another particular favorite. She manages to remain an optimist even in the face of Eugenia's relentless crabbiness. 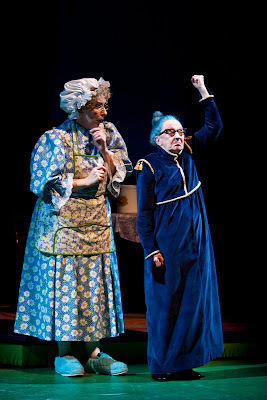 Elizabeth Griffith and Wendy Lehr in Children’s Theatre Company’s Mercy Watson to the Rescue! Photo by Dan Norman. WE: Which character or scene(s) from the books are you most looking forward to seeing on stage? KD: Well, I can't wait to see that bed (with Mr. Watson and Mrs. Watson and Mercy in it) fall through the floor. How will they do that, I wonder? Elizabeth Griffith, Reed Sigmund and Gerald Drake in Mercy Watson to the Rescue! Photo by Dan Norman. WE: Your work has previously been adapted for film. How has the adaptation of your work differed for live theatre? KD: This will be the first time I have seen my characters on a stage. I imagine that it will be similar, in some ways, to seeing them on a screen . . . a feeling of your kids having grown up and left home. Some pride. Some wonderment. And a little fear. Reed Sigmund, as Francine Poulet, Animal Control Officer. Photo by Dan Norman. WE: How did the partnership with Children's Theatre Company begin? KD: I did a fundraiser for them last summer and my agent said, "Hey, don't you think it would be the perfect venue for Mercy?" 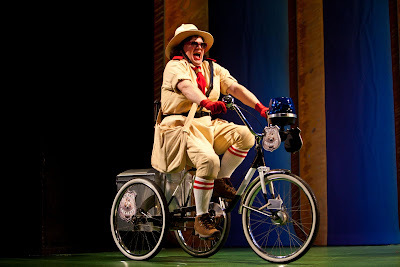 Jason Ballweber and Sara Richardson in Children’s Theatre Company’s Mercy Watson to the Rescue! Photo by Dan Norman. WE: Describe the feelings you've experienced as you await Opening Night and the anticipation of seeing your characters and stories come to life on stage. KD: Well, I *am* nervous. But the energy and idiocy and joy of Mercy seem like a perfect fit for the stage. And CTC does such amazing productions. So mostly, I just can't wait. WE: Thanks so much, Kate! We love the book, and am sure that the play will inspire even more kids to read! Highly recommended! Mercy Watson to the Rescue! opens Fri., Sept. 9 (previews begin Tues., Sept. 6), and runs through Sun., Oct. 23. Ticket prices range from $26—$40 for adults and $16—$30 for children (17 & under), students and seniors and are available by calling (612) 874-0400 or by visiting childrenstheatre.org. 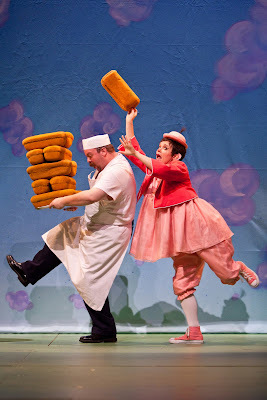 Also upcoming in the 2011-2012 season are: an inventive production of Madeline L’Engle’s beloved A Wrinkle in Time (c. 1962), the magical Wizard of Oz, Harold and the Purple Crayon, by Seattle Children’s Theatre, Lizzie Bright and the Buckminster Boy and Pippi Longstocking. Children’s Theatre Company (CTC) is the first theatre for young people to win the coveted Tony® Award for Outstanding Regional Theater (2003). Founded in 1965, CTC serves more than 300,000 people annually and is one of the 20 largest theater companies in the nation. CTC is noted for defining worldwide standards for youth theatre with an innovative mix of classic tales, celebrated international productions and challenging new work. 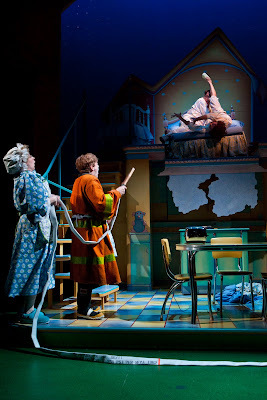 Photos courtesy of the Children's Theatre Company, copyright as noted.